This is a quick but satisfying supper. 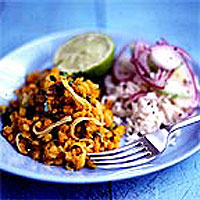 You can vary the accompanying salad ingredients to taste, or accompany the dhal with a dry vegetable curry. If you ever go to Indian grocery shops, look out for black cardamoms. A couple added to the rice will imbue it with a wonderful, resinous aroma. Begin with the rice. Melt the butter over a low heat and add the black peppercorns, clove and bay leaf. Fry for a minute until they begin to release their scent, then stir in the rice. Fry for a further 2 minutes, stirring occasionally. Add salt to taste and 400ml cold water. Set over a high heat, until it comes up to the boil, then reduce the heat to very low, cover and cook for 15 minutes or until it is just tender and the water is absorbed. Turn off the heat (remove if on a heat-retaining electric ring) and leave to steam, still covered, for 5 minutes, or until the dhal is ready. While the rice is cooking, wash the lentils in a sieve under the hot tap. Place in a saucepan with the turmeric and a pinch of chilli powder. Add 400ml boiling water and gently boil for 15 minutes or until very soft, but still retaining their shape. Season to taste with salt. Once the lentils are cooking, melt 20g butter in a small frying pan and gently fry the onion until soft and golden - about 10 minutes. Continue by preparing the salad vegetables. When everything is nearly ready, stir the garam masala and about 1/4 tsp chilli powder into the frying onions, stir briskly for 30 seconds, then add the coriander and mix into the lentils. Adjust the seasoning to taste and serve immediately with the rice, vegetables and lime quarters. Season the vegetables with salt, freshly ground black pepper and lime juice. You may like to add a squeeze of lime to the dhal as well.